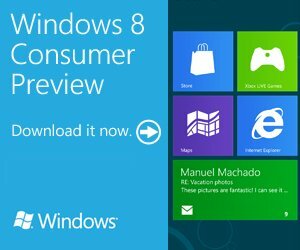 Microsoft has released the public beta version of Windows 8, you can download it at http://preview.windows.com. The Consumer Preview is offered in English, German, French, Japanese and Chinese, and is available in a 32-bit and 64-bit edition. Windows 8 Consumer Preview features a functional Windows Store and includes Internet Explorer 10 Platform Preview 5. Connecting to the cloud across Windows-based PCs and Windows Phone. The Windows 8 Consumer Preview offers seamless integration with the content people care about across their devices. An optional additional sign-on with a Microsoft account provides access to a host of features, including the ability to roam all settings, use cloud storage, communicate with email, calendar and contacts, and connect to a broad range of services. Your connection to the cloud works across your Windows-based PCs and your Windows Phones. Metro UI is FAIL on PC!